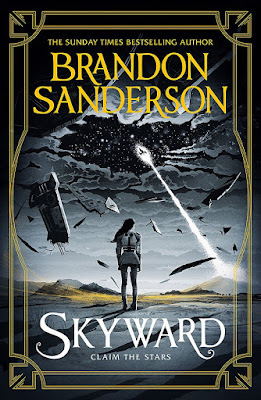 I've been wanting to read more books by Brandon Sanderson ever since I read the last few books in the Wheel of Time series so what better place to start than with Skyward, the first book in his new YA sci-fi series. I'm happy to say that this has now solidified my position as a fan and I'm looking forward to working my way through his huge backlist! Spensa grew up wanting to be a fighter pilot like the father who was a hero to her, even when he was killed in action after being branded a traitor all she wanted to do is follow in his footsteps and find a way to clear his name. Being the daughter of a coward has followed her everywhere, her family are looked down on and she is picked on constantly but she refuses to give up on her dream - no matter how many people try to stop her joining flight school and fighting to protect her people. You see Spensa's people have been at war with an alien race for hundreds of years and their situation is getting more and more desperate. They have been under attack ever since they crash landed on their planet and the Krell seem determined to destroy what is left of the human race. Nobody knows quite why the Krell keep attacking but it is getting harder and harder to fight them off as they loose ships and fighter pilots more and more frequently. Flight school is dangerous and only a tiny percentage of cadets even survive the course but Spensa is determined to be one of them and she will do whatever it takes to earn her chance to fly. Skyward was a fantastic start to this new series, the world building was brilliant and I loved the fight training missions and battles with the Krell, there were a lot of edge of your seat moments because things are so dangerous and Brandon Sanderson isn't afraid to sacrifice his characters so that heightens the sense of fear as you're reading. Spensa is such an interesting character, she has a bit of a chip on her shoulder thanks to the way she's always been treated and she puts on a layer of bravado to face the world so she can come across as a little aggressive and full of herself but underneath all of that she's scared and vulnerable and very, very easy to like. I loved getting to know her and the rest of the kids in the Skyward Flight, these characters were all very complex with their own motivations, fears and dreams and they all changed and grew throughout the story (well the ones who survived did anyway!). I have to give a shout out to M-Bot and Doomslug who were both fantastic additions to the story, M-Bot was hilarious and I loved the way he looked at the world while Doomslug was just super cute. I really enjoyed the way Brandon Sanderson slowly reveals information about events surrounding the death of Spensa's father, and all the questions he raised about the Krell and why they were so determined to fight humans. Some of those questions are answered by the end of the book but others are left open for future instalments, I'm definitely going to be first in the queue for the sequel when it's published. 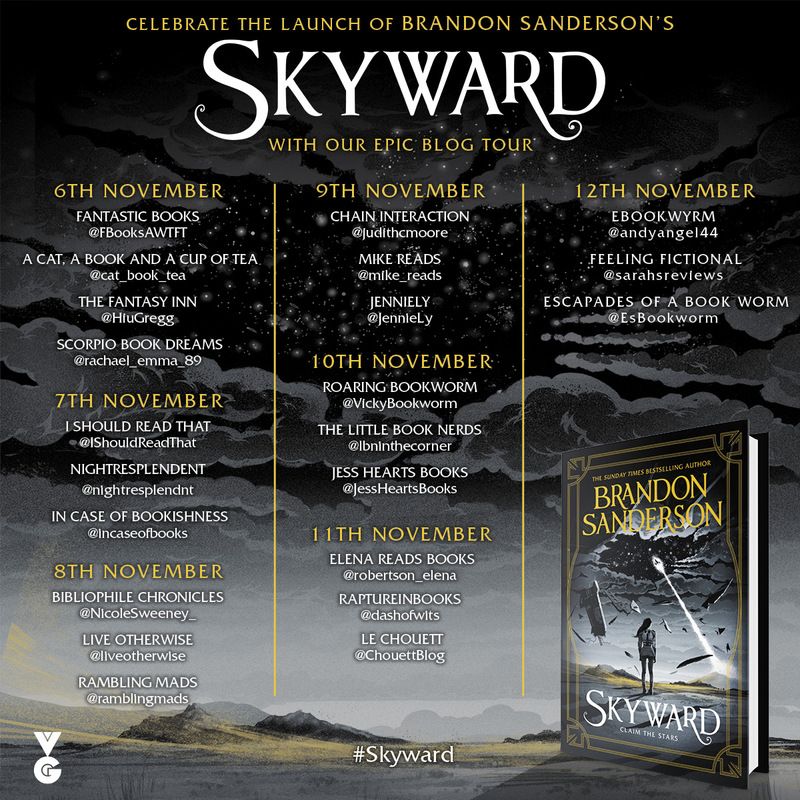 If you're looking for a book with daring aerial battles, fantastic characters, a talking spaceship, alien invasions and a character who just won't take no for an answer then you can't go wrong with Skyward! Don't forget to check out the rest of the stops on the Skyward blog tour!